The global HIV/AIDS epidemic is an unprecedented crisis that requires an unprecedented response. In particular it requires solidarity -- between the healthy and the sick, between rich and poor, and above all, between richer and poorer nations. We have 30 million orphans already. How many more do we have to get, to wake up? today is world aids day. world aids day reaches back to 1987 and WHO's global programme on aids based out of geneva switzerland. since 1995, the us government has issued an official proclamation. Today, we reflect on the strides we have taken toward overcoming HIV/AIDS, honor those who have made our progress possible, and keep in our thoughts all those who have known the devastating consequences of this illness. The road toward an AIDS-free generation is long -- but as we mark this important observance, let us also remember that if we move forward every day with the same passion, persistence, and drive that has brought us this far, we can reach our goal. We can beat this disease. On World AIDS Day, in memory of those no longer with us and in solidarity with all who carry on the fight, let us pledge to make that vision a reality. 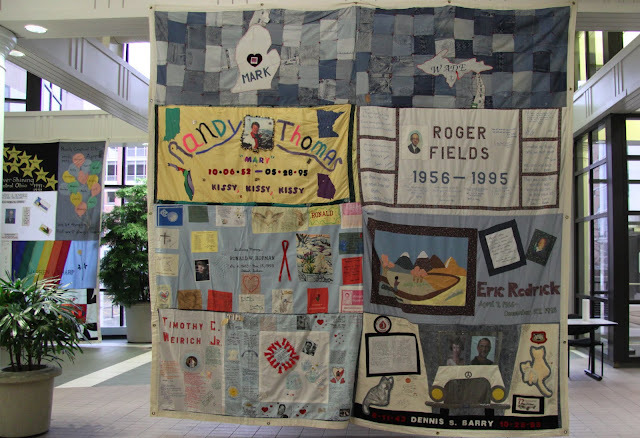 photo: one of the 128 panels of the names project aids quilt that were on display in cleveland during the weeks surrounding last year's world aids day. okay, so today's song/video is an advert for coca cola, the action in the video is real thing!! watching this sure makes me feel good and i hope it makes you feel good also! from my research (google) i learned the advertisement came out this summer. i must not have been watching much television during the summer as i don't remember seeing it; the first time i saw it was last night when a friend posted it on his facebook page. by the way the ad is set to supertramp's 1970s bubbly sweet tune and is performed by roger hodgson. roger along with being a member of supertramp (1969-1983) also toured with ringo starr's all star band in 2001. these days roger still performs sometimes as a solo but other times with other musicians and sometimes with full orchestras! It's been 20 years since my friend Larry died from AIDS. It's such a devastating disease. When I posted that video I had no idea it was a Coke commercial! Ha!